Rights: © VCU. Licensed under a Creative Commons Attribution-Noncommercial-Share Alike 3.0 Unported License. http://creativecommons.org/licenses/by-nc-sa/3.0 Acknowledgement of the Virginia Commonwealth University Libraries as a source is required. 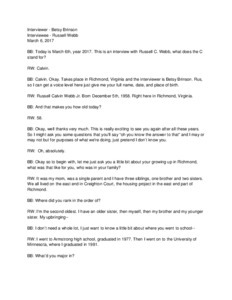 Webb, Russell, “Russell Webb oral history transcript,” VCU Libraries Gallery, accessed April 22, 2019, https://gallery.library.vcu.edu/items/show/86238.